The Engineering Education Research Briefs podcast aims to expand the boundaries of engineering education research by exploring new frameworks, new methods, and new findings with the researchers who created them. Alice shares how she incorporates feminist theory into engineering education research to look at why the field of engineering remains to be male-dominated. Specifically, we discuss her Guest Editorial from the October 2017 issue of the Journal of Engineering Education: Shifting the ‘‘Default’’: The Case for Making Diversity the Expected Condition for Engineering Education and Making Whiteness and Maleness Visible. Dr. Ruth Streveler interviews 5 Purdue Engineering Education PhD graduates about their current contributions. Recorded in June 2018 at the American Society for Engineering Education (ASEE) conference in Salt Lake City, Utah. Dr. Julia Thompson, ENE PhD '15, Director of EPICS at San Jose State University discussed the new online journal, Murmurations. Dr. James Huff, ENE PhD '14, Assistant Professor of Engineering Education at Harding University introduces us to Interpretative Phenomenological Analysis. Dr. Diana Bairaktarovka, ENE PhD '13, Assistant Professor of Engineering Education at Virginia Tech tells us about her new research project exploring difficult concepts in thermodynamics. Dr. Aidsa Santiago-Román, ENE PhD '09, Professor and Head of the Engineering Science and Materials Department at the University of Puerto Rico – Mayaguez (UPRM) recounts how her Department supported UPRM students and their families in the aftermath of Hurricane Maria. Dr. Meagan Pollock, ENE PhD '14, is an entrepreneur whose organization, Design Connect Create, promotes increasing the participation of women in STEM. On this Episode the Research Briefs Podcast Dr. Ruth Streveler interviews Dr. Shane Brown, Associate Professor of Civil Engineering at Oregon State University. Shane discusses his research on conceptual understanding of important engineering concepts by undergraduate engineering students and practicing engineers. He highlights the role that “context” plays in building conceptual understanding. On this Episode the Research Briefs Podcast Dr. Ruth Streveler interviews Dr. Devlin Montfort, assistant professor in the School of Chemical, Biological, and Environmental Engineering at Oregon State University and Dr. Geoffrey Herman, teaching assistant professor in the Department of Computer Science at the University of Illinois at Urbana-Champaign. Devlin and Geoffrey discuss a new method of analyzing student transcripts called novice-led thematic analysis. Dr. Ruth Streveler interviews Dr. Nadia Kellam, Associate Professor in the Polytechnic School of the Ira A. Fulton Schools of Engineering at Arizona State University. Nadia discusses her use of narrative research methods and I-poems. Dr. Ruth Streveler interviews Dr. Nicki Sochacka, the Associate Director for Research Initiation and Enablement in the Engineering Education Transformations Institute (EETI) in the College of Engineering at the University of Georgia. Nicki shares her new research on how stories help shape and reflect engineering cultures and norms and values. Sochacka, N., Walther, J., Wilson, J. & Brewer, M. (2014). Stories ‘told’ about engineering in the media: Implications for attracting diverse groups to the profession. Paper presented at the Annual ASEE/IEEE Frontiers in Education Conference, Madrid, Spain. Dr. Ruth Streveler interviews Dr. James Huff, Assistant Professor of Engineering Education at Harding University. James discusses his use of Interpretative Phenomenological Analysis (or IPA). Our guest this episode is Dr. Joachim Walther from the University of Georgia College of Engineering. Dr. Walther the founding director of the Engineering Education Transformations Institute at the University of Georgia, and he is here to discuss his Qualifying Qualitative Research Quality (Q3) framework. Our guest this episode is Dr. Allison Godwin, an assistant professor in Engineering Education at Purdue University. Dr. Godwin discusses new frameworks and methods for exploring diversity and inclusion in engineering. Our guest this episode is Dr. Lisa Benson, a professor in the Department of Engineering and Science Education at Clemson University and the Editor of the Journal of Engineering Education. Dr. Benson discusses her vision for JEE and how JEE can expand the boundaries of engineering education research. Our guest this episode is Dr. Karl Smith, Cooperative Learning Professor of Engineering Education at Purdue and Emeritus Professor of Civil, Environmental, and Geo-Engineering at the University of Minnesota. Karl shares his 40-year journey as an advocate for cooperative learning in engineering education. This episode was hosted by Dr. Ruth Streveler, produced by the School of Engineering Education at Purdue, and features music from Patrick Vogt. On this episode of the Research Briefs podcast, Dr. Ruth Streveler interviews Dr. Shawn Jordan, Associate Professor of Engineering at Arizona State University. Shawn shares how he uses storytelling principles in his research and to broaden participation in engineering. 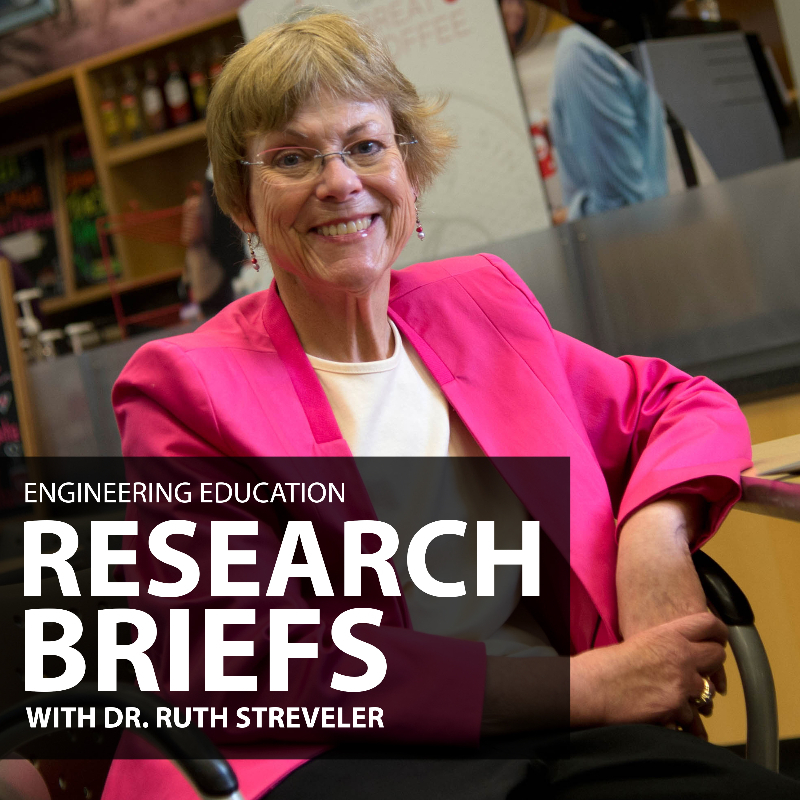 This episode was hosted by Dr. Ruth Streveler, produced by the School of Engineering Education at Purdue, and features music from Patrick Vogt. Research Briefs is produced the School of Engineering Education. Theme music was composed by Patrick Vogt, and audio is transcribed by Rick Martin.